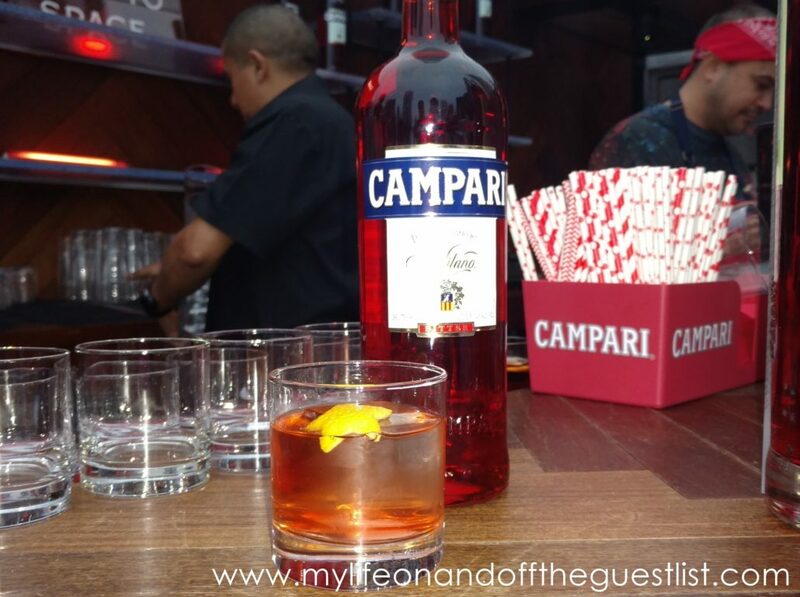 Hello fellow Campari fans, we had a blast celebrating Campari and Imbibe Magazine’s Sixth Annual Negroni Week. This year’s Negroni Week kick-off party was everything we could have asked for and more. Not only did we indulge in a variety of specialty made Negroni cocktails, we thoroughly enjoyed the surprise pairing session and evening’s entertainment. 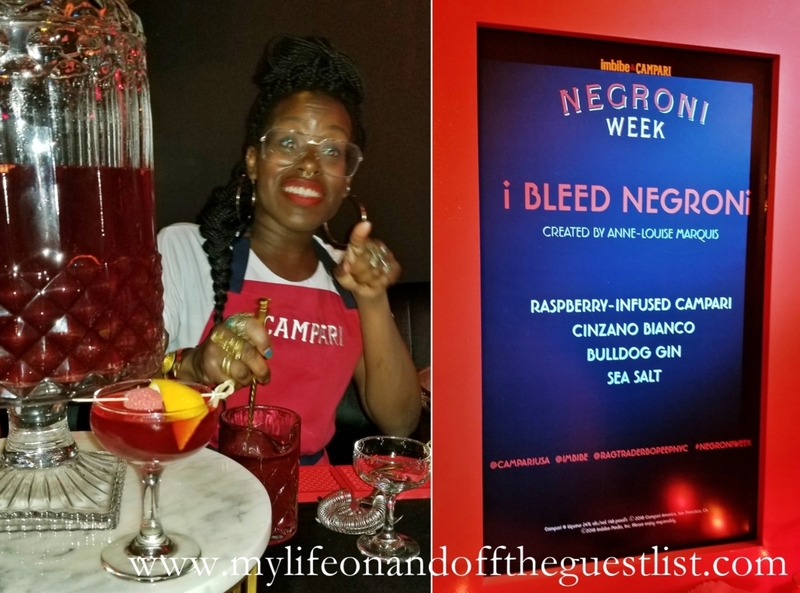 For the sixth annual Negroni Week, the Ragtrader was turned into the gateway to a Campari heaven, celebrating Italy’s iconic red Aperitivo and the global charity initiative. The main level of The Ragtrader featured four fun takes on the classic Negroni cocktail from NYC’s top bartenders, as well as servings of Negroni-inspired bites. We enjoyed the following cocktails: the Beyond Tiki Paradise Negroni created by Felicia Chin-Braxton, the Beyond Bitter New-Groni created by Daniel Warrilow, the Beyond Bubbles Thai Basil Sbagliato created by Stacey Swenson, and the I Bleed Negroni created by Anne Louise Marquis. 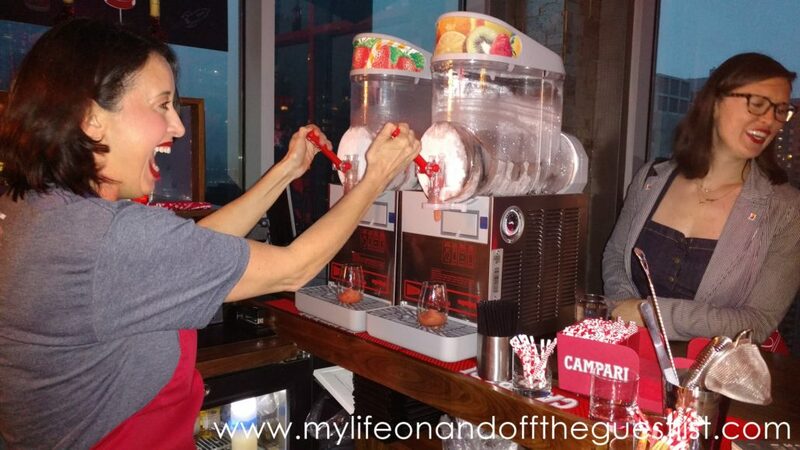 On the lower level, dubbed Club Negroni, there was an entire bar dedicated to one interactive activity – a Negroni and food pairing featuring three cocktails paired with a savory, sweet, and creamy amuse bouche. 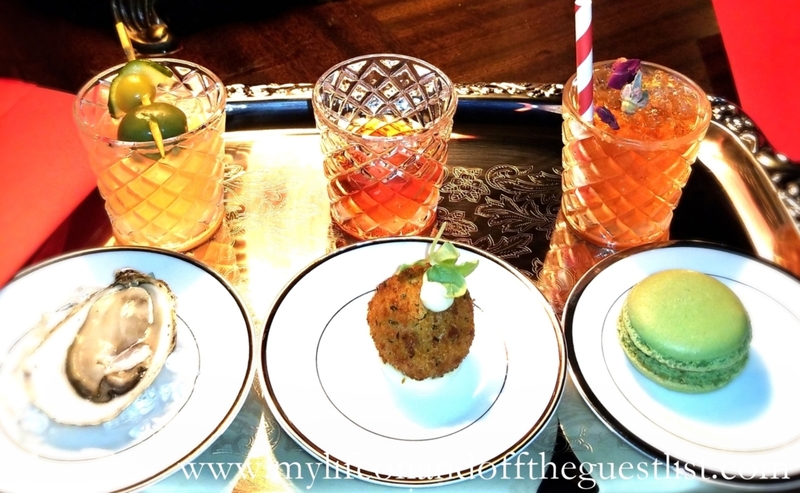 From left to right, we had Bitter & Brine: Vine-Groni cocktail paired with a Citrus-topped East Coast Oyster; The Sweet & Heat: Roni Negroni cocktail paired with a Cacio e Pepe Arancini Bite; and Petal & Pistachio: Rosy Negroni cocktail paired with a Creamy Pistachio Macaron. The Club Negroni entertainment was wonderfully provided by a hilarious pianist who kept the crowd going with Hip Hop and Rap renditions. You couldn’t ask for better music while sipping on the almost unlimited flow of Negroni Week cocktails. 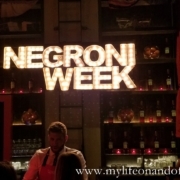 If the festivities we enjoyed at the Negroni Week kick-off party are any indication, the sixth annual Negroni Week is sure to be an amazing one. We are sure this year will raise more money than the $537,439 that was raised last year. 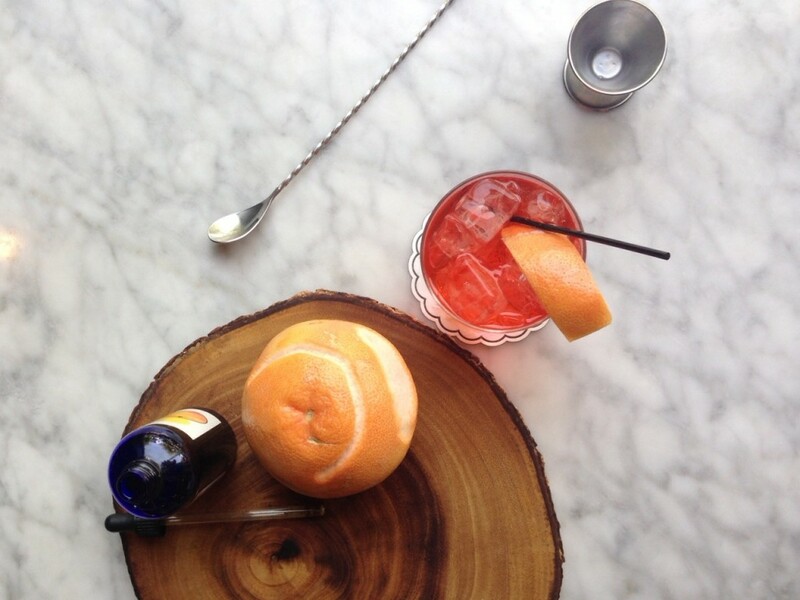 Did you partake in the sixth annual Negroni Week festivities? You’ve all heard of shopping for a cause, now it’s time to drink for a cause. 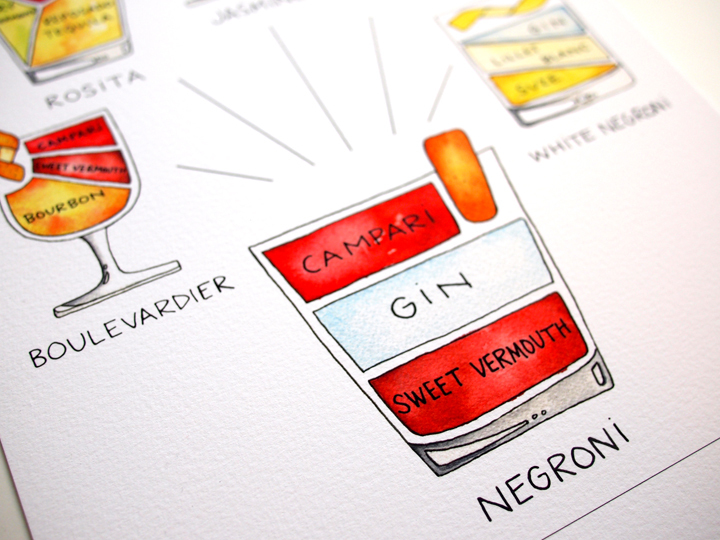 Once again Campari and Imbibe Magazine returns for the 6th year of Negroni Week. The iconic red Italian Aperitivo will be the key ingredient of the global charity initiative that will take place from June 4th-10th, 2018. 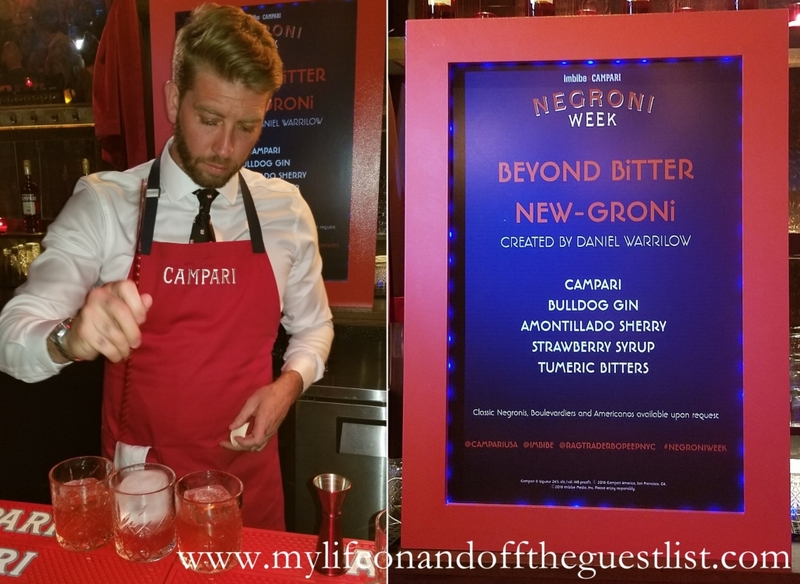 Bars, restaurants, and retailers around the world will come together over the classic Negroni cocktail – an iconic mix of equal parts Campari, gin and sweet vermouth – to raise money and awareness for charitable causes. 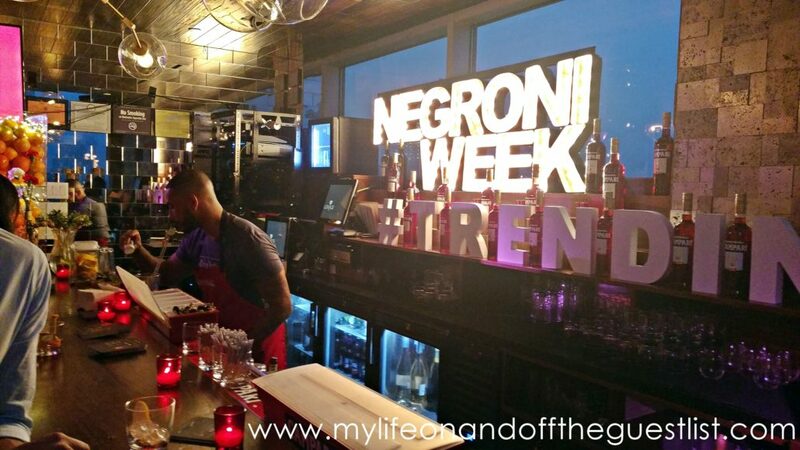 Starting with just 100 participating bars in 2013, last year’s Negroni Week welcomed the involvement of 7,770 partners in 60 countries to raise a phenomenal $1.5 million for charitable causes since the initiative’s launch. The 6th year of Negroni Week promises even more. 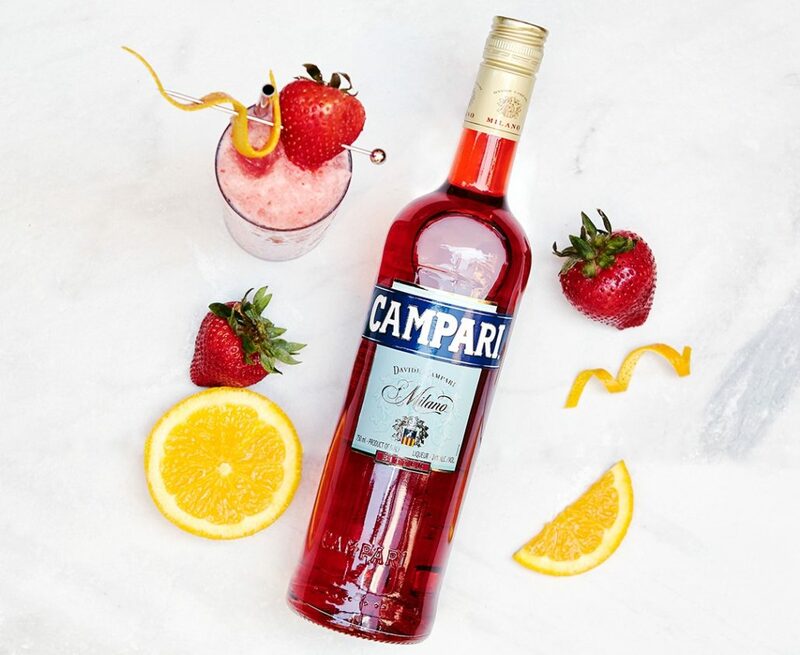 To amplify the program’s charitable roots, Campari will be working in partnership with the USBG National Charity Foundation (USBG Foundation) to host its first-ever Campari Community Service Day. On June 5 in over twenty cities across the U.S., bartenders and Campari employees in their respective cities will gather for activities such as volunteering at local animal shelters, organizing beach cleanups and preparing and delivering meals to local charities, community groups and firehouses, feeding the people who are making a positive impact in their local communities. Tony Abou-Ganim will once again lead the Team Negroni bike rides where bartenders and cycling enthusiasts ride through twelve plus cities, including San Francisco, New York, Washington D.C., and Chicago during Negroni Week to benefit the Helen David Relief Fund. 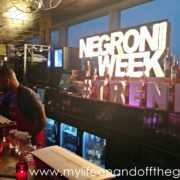 Along with visiting participating bars and restaurants to buy a Negroni cocktail for charity, you can also buy some distinctive Negroni merchandise to help raise even more money. 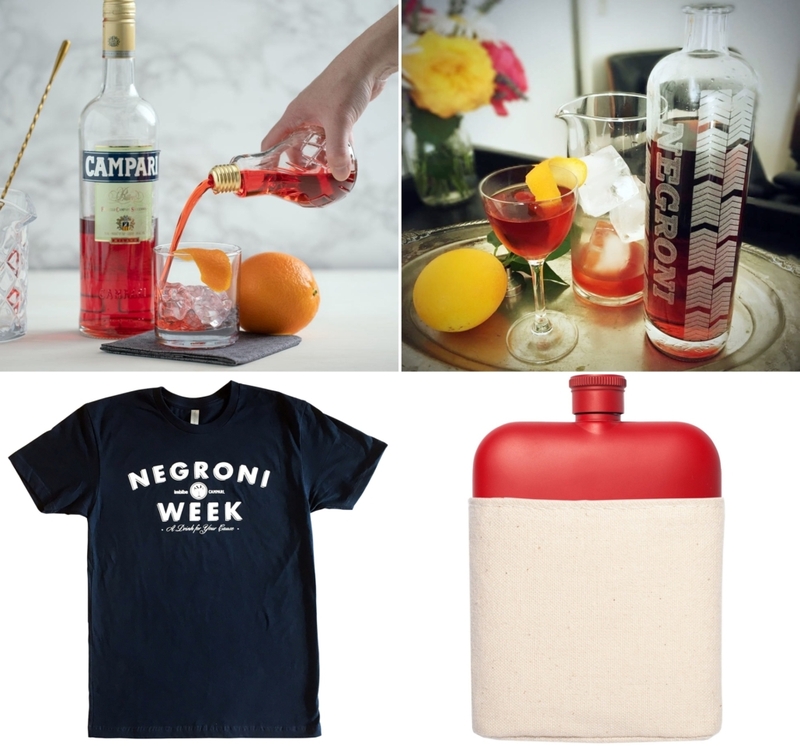 Negroni Week inspired merchandise includes Negroni Lightbulb Decanter, Izola’s Red Matte Canvas Flask, official Negroni Week T-Shirts, Gaz Regan Negroni Finger Stirrer, Reclamation Etchworks Laser-Etched Decanters, etc. A percentage of sales from each item will benefit various charities. 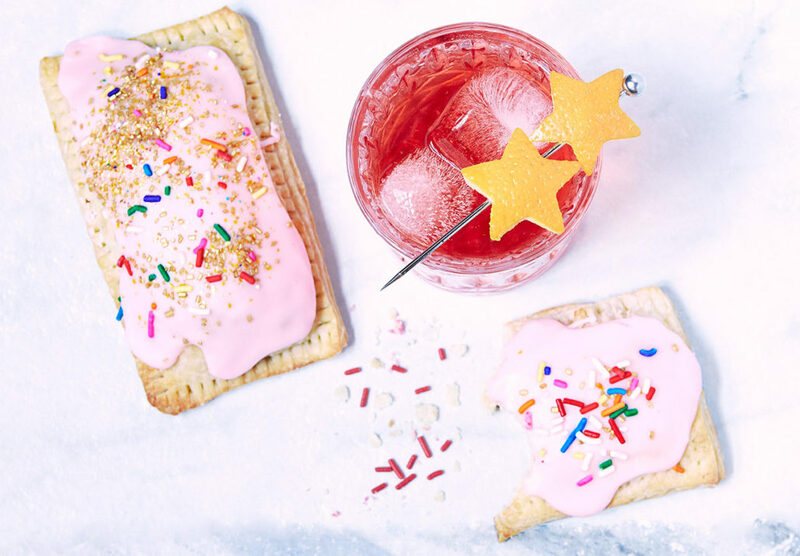 Several national partners have already committed to participating in Negroni Week, including Altamarea Restaurant Group, Hilton Hotels, Freehand Hotels, Caffè Umbria, and Hedley & Bennett. 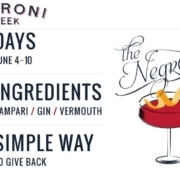 All of Freehand’s hotel locations will allow guests to donate a portion of their room stay to Children of Restaurant Employees (and save 10%) during the month of June by using the code NEGRONIWEEK. Caffè Umbria will be offering a special Negroni-inspired coffee that will be available at caffeumbria.com and at their cafes in Portland, Seattle, and Chicago, with a portion of proceeds benefitting No Kid Hungry. Adding a touch of style to the Negroni Week offerings, Hedley & Bennett has created a limited-edition Negroni Week apron (pictured above), also benefitting No Kid Hungry. 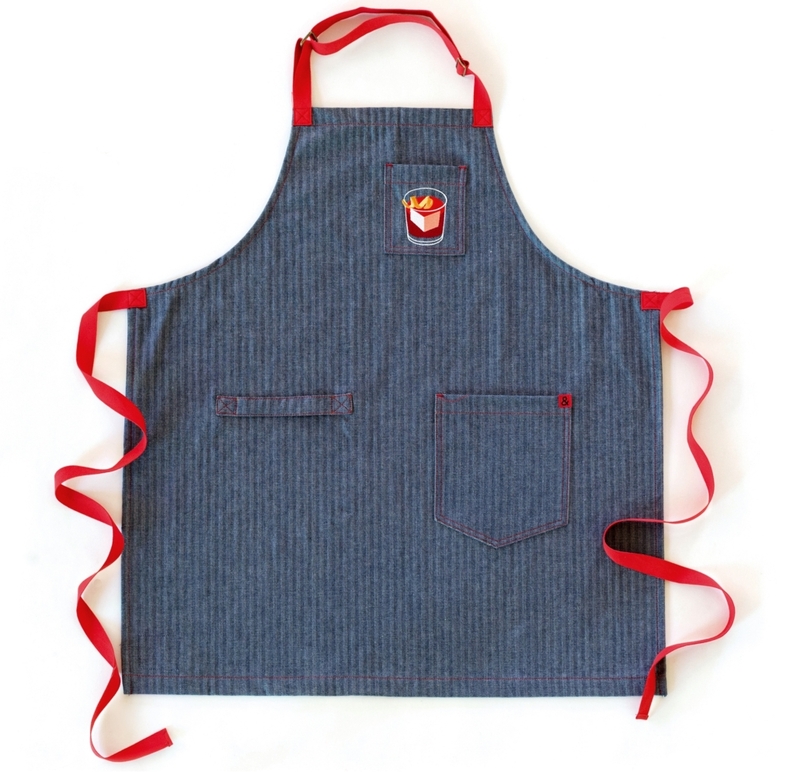 The aprons are handmade with herringbone and feature an embroidered Negroni on the top pocket for those who wish to wear their love for the classic cocktail on their heart. 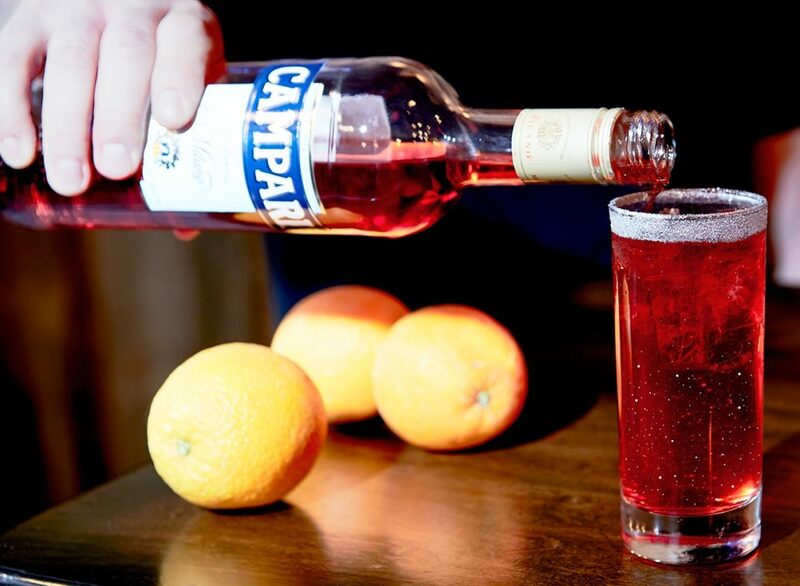 Campari and Imbibe will be celebrating the 6th year of Negroni Week with kickoff events in San Francisco and New York, all benefitting local charities. 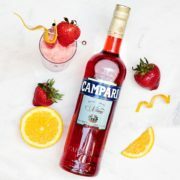 Campari will also sponsor the eighth annual Negroni Social in Portland, Oregon on June 3 as well as a wrap event with Dante NYC on June 10 to close out another successful year of charitable giving. 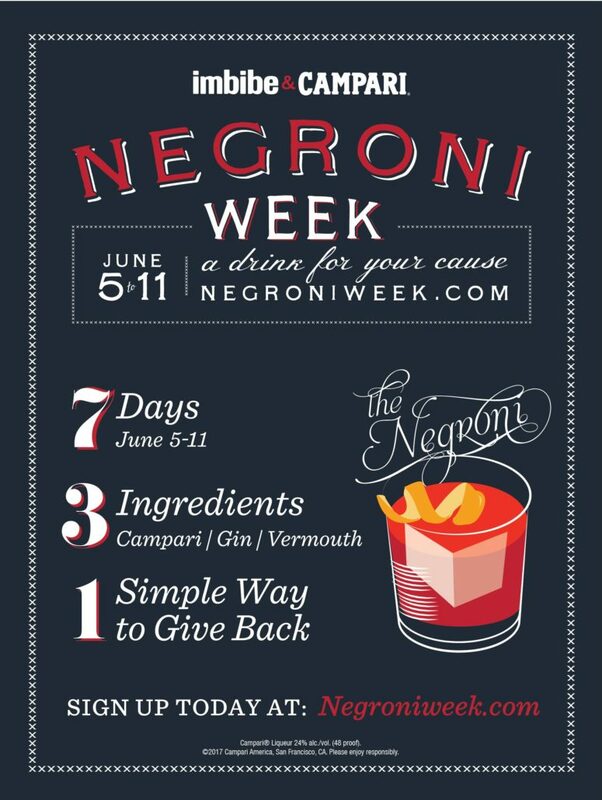 Will you be helping in drinking for a cause by joining in the 6th year of Negroni Week festivities? 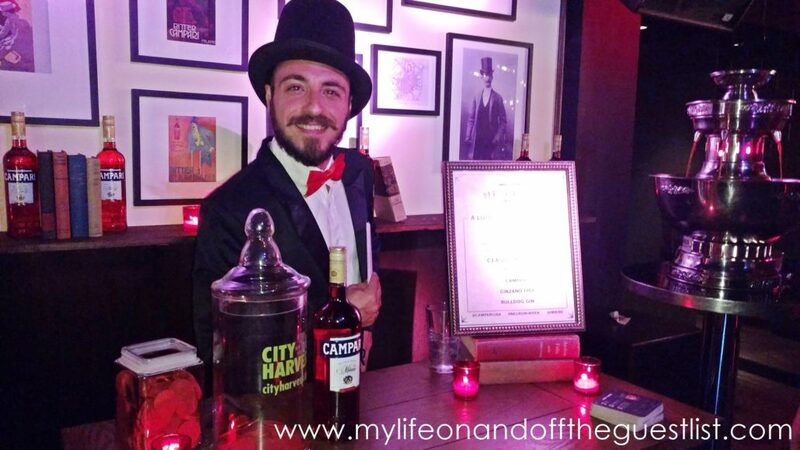 We hope you guys had a wonderful time celebrating the fifth year of Campari Negroni Week because we certainly did. 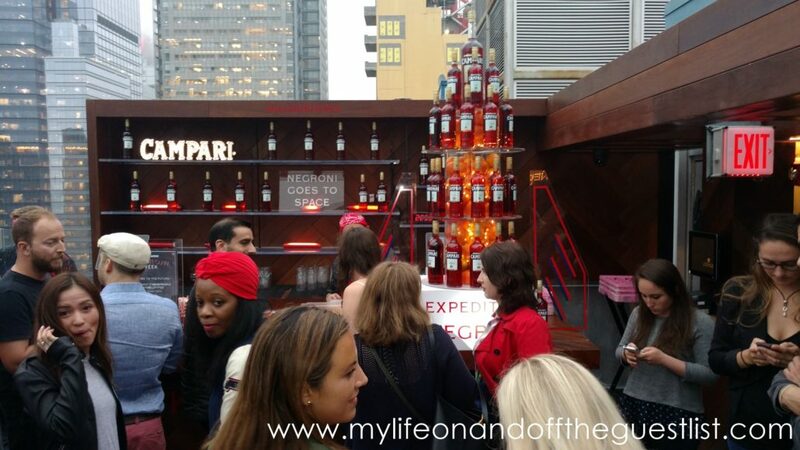 We had the pleasure of celebrating the apéritif at the Negroni Week VIP kickoff event with Imbibe Magazine at Lovage, the rooftop bar with 360-degree views. 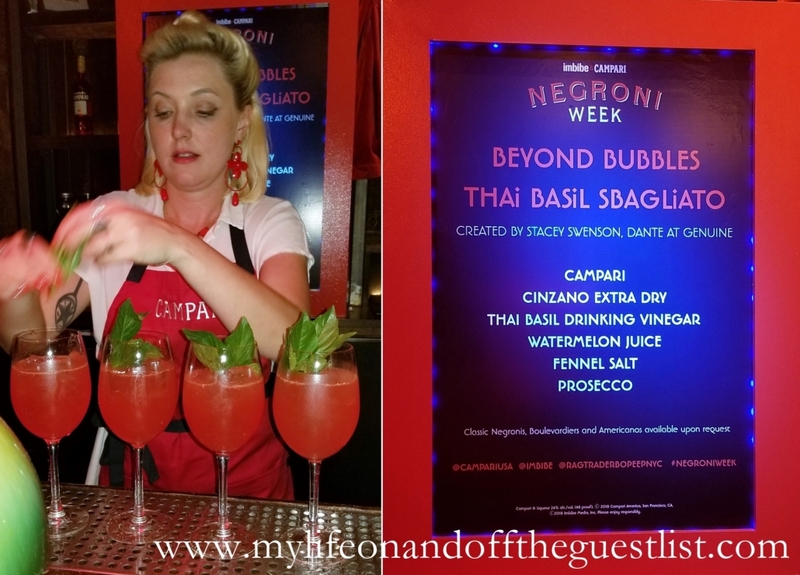 The Campari Negroni Week kickoff event featured several cocktail stations, where guests enjoyed several variations of the Campari cocktail. The evening was a journey through many modern day interpretations of the Negroni cocktail, in various forms. 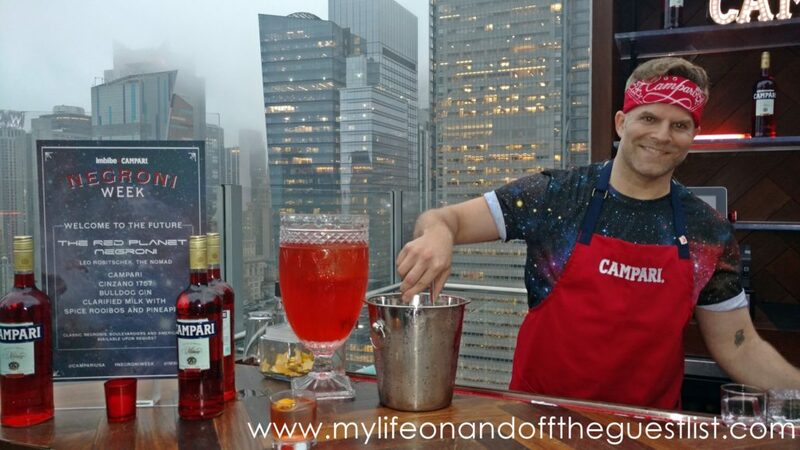 We started our Campari Negroni Week cocktail journey with the Mai Tai Unigroni, a delicious concoction created by Joshua Anthony Campbell of Leyenda. 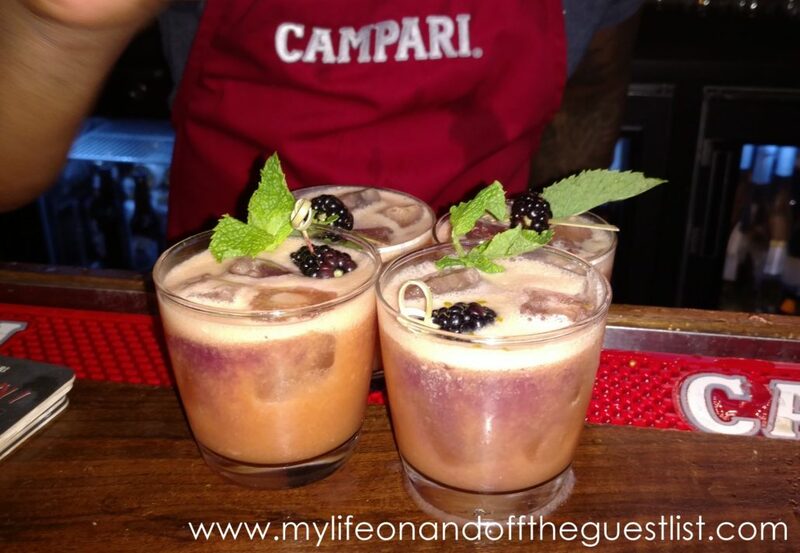 This Negroni version of a Mai Tai was one of the favorites of the event’s guests, it was definitely one of ours. For our next cocktail, we wanted something out of the world that would transport us (and our tastebuds) to another dimension, and the iridescent Galaxy Negroni Sbagliato, by Naren Young of Dante, was the perfect galactic cocktail to get us there. 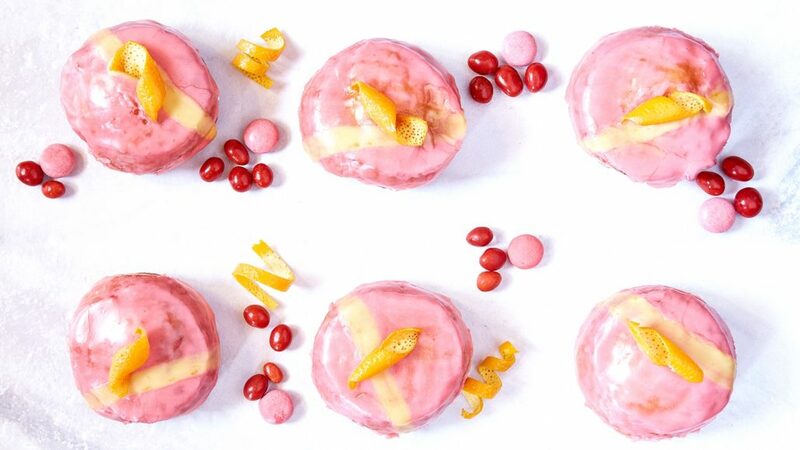 We took a break from cocktails to enjoy one of the amazing Negroni edible treats, including the Negroni Pop Tarts from Scotch & Butter, Negroni Donuts from The Doughnut Project, and the most delightful Negroni Gelatin Balls. After we had our fill, we continued on to our next cocktail, a frozen delight called the Frogoni, created by Julie Reiner, of the Clover Club. 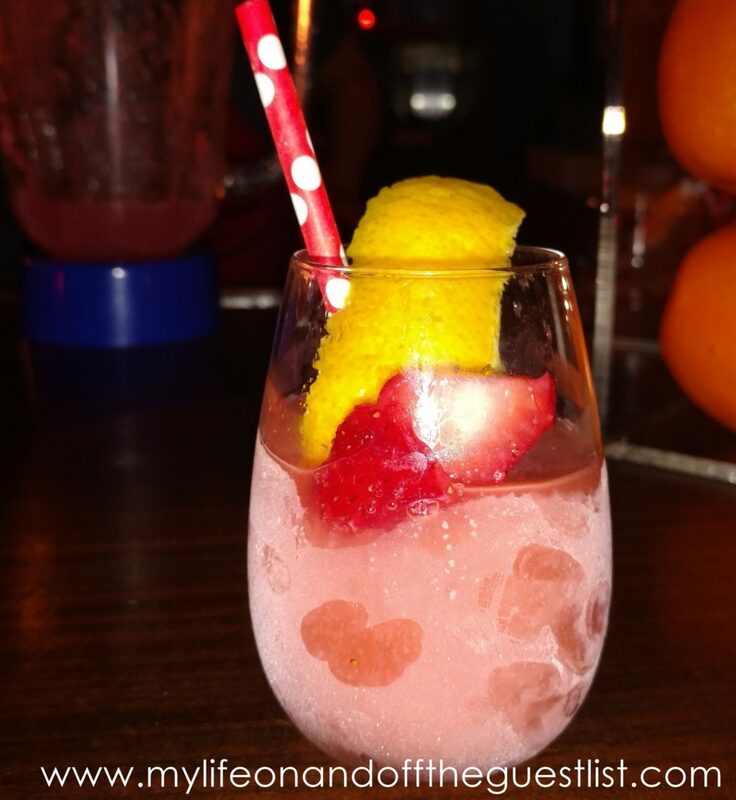 This slushy cocktail, whose ingredients included Campari and fresh strawberries, was the perfect way to cool down. The flow of cocktails didn’t stop as we moved on to enjoy a few more libations. This time we went for the more classic Negroni cocktails. First up was The Red Planet Negroni, a classic looking drink boasting bold flavors by Leo Robitschek from The Nomad (you may remember his name as the creator of the amazing Red Velvet Swing cocktail from our holiday event with Campari). Our next and last cocktail of the evening was the Classic Negroni, the perfect end to an event honoring the iconic cocktail. 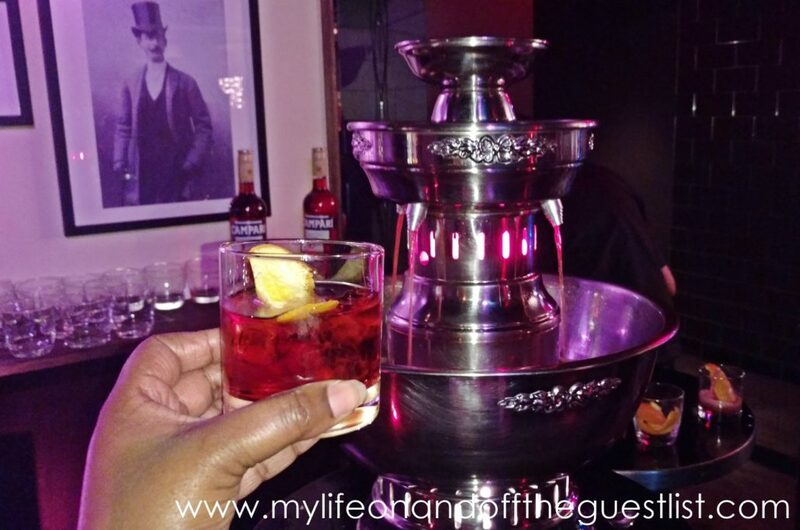 With the help of Mr. Negroni (and an ever-flowing Negroni fountain), we savored the simple, sophisticated cocktail as the event came to an end. And that, dear readers, is how we celebrated Campi Negroni Week. We hope you had a great time honoring the week long event as well. There’s much to celebrate next week, and we plan on raising a glass, a spoon and an appetite as tribute. 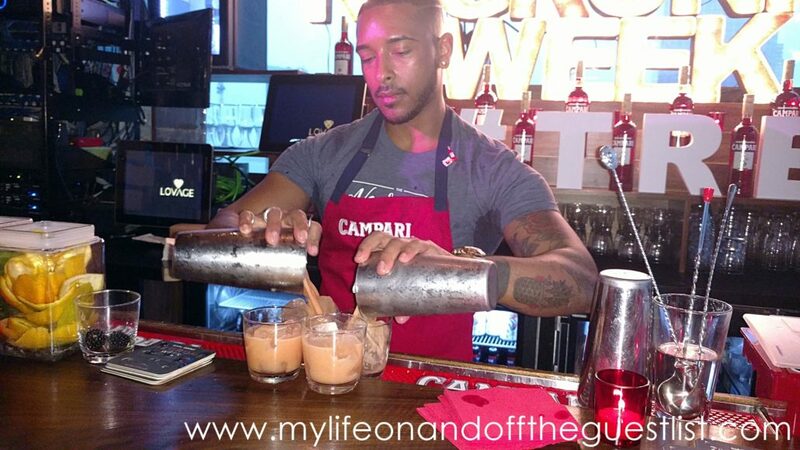 For those of you not familiar, Campari’s fifth annual Negroni Week kicks off on Monday, June 5th. 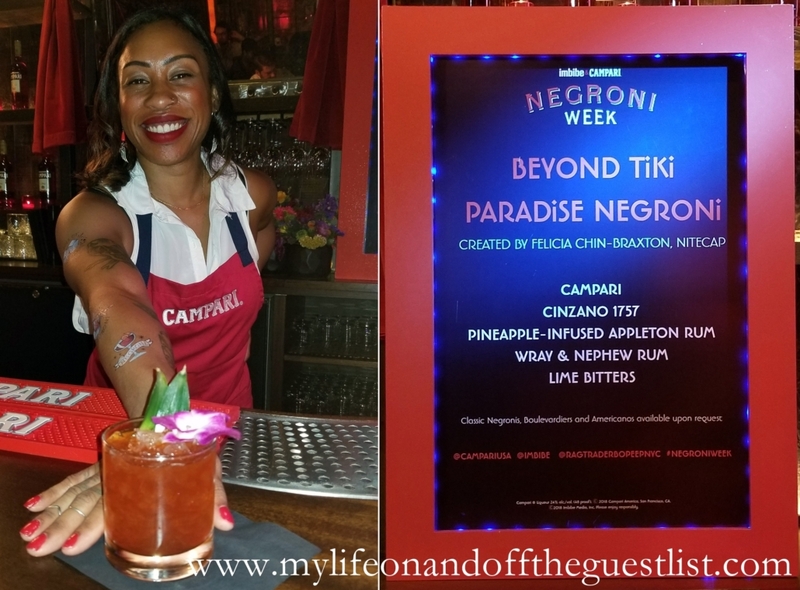 Negroni Week, presented by Imbibe Magazine and Campari, is a week-long international Campari cocktail celebration from June 5th-11th, that brings bartenders, restaurants, and Campari lovers together to celebrate one of the world’s greatest cocktails, the Negroni. 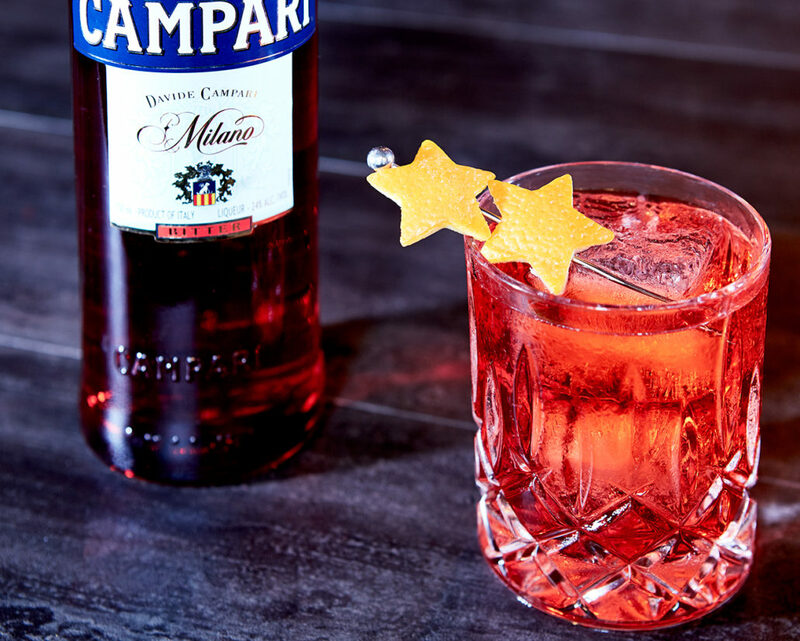 Commemorating its fifth year, Negroni Week will be celebrated at 6,000 bars and restaurants around the world, who will be mixing classic Negronis and Negroni variations for a great cause. This week-long event not only celebrates one of the world’s great cocktails, like the one featured below, it also helps to raise money for charities around the world. Follow instructions below to create clarified milk punch. Serve in a rocks glass filled with ice. 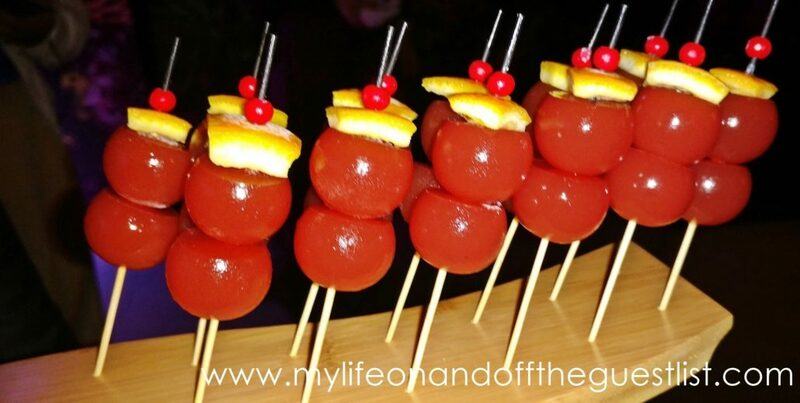 Garnish with two star-shaped orange twists. Heat up milk until just under a simmer. Take the pot off the heat and add the lemon juice. Stir slowly until the curds and the whey separate. Add the remaining ingredients and mix. Pour all of the ingredients slowly through a superbag until the punch becomes clear, and the repeat the filtering process. 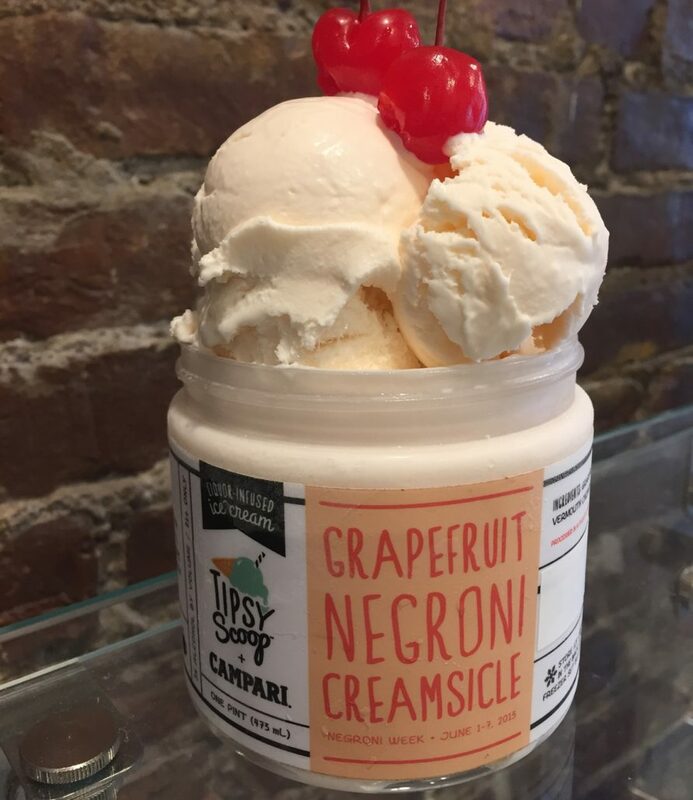 Some of the delicious treats and concoctions Negroni fans will be able to enjoy during the week-long celebration include classic Negroni cocktails, the above Red Planet Negroni cocktail, Mai-Tai Unigroni cocktail, and Galaxy Negroni Sbagliato cocktail. 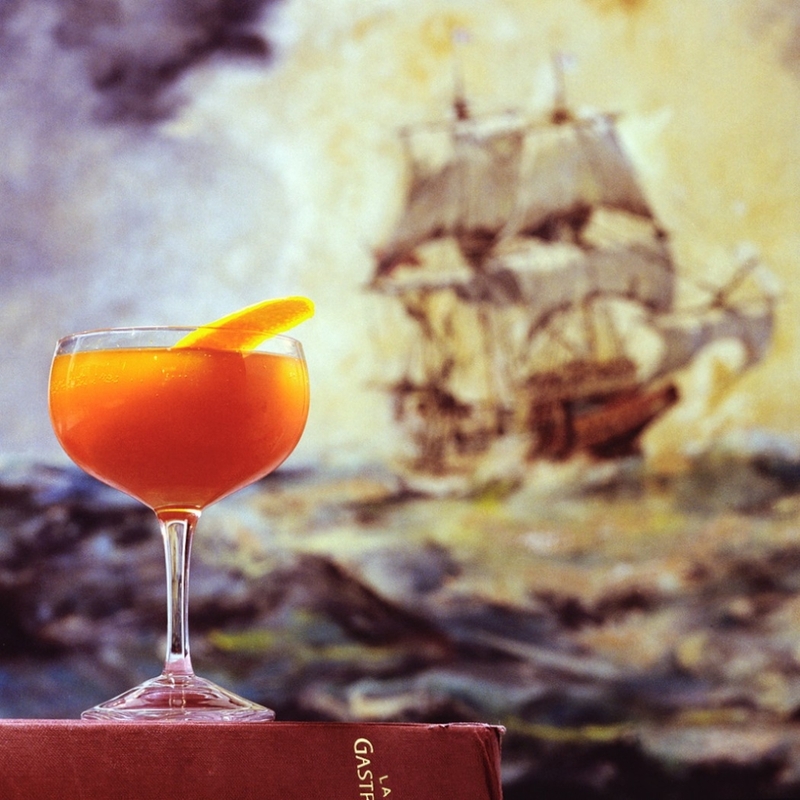 Pour Campari and Cinzano 1757 over ice in a collins glass that has been sprayed with a chamomile tincture. Add 3 dashes of chamomile tincture and a pinch of edible silver glitter. Top with Prosecco. 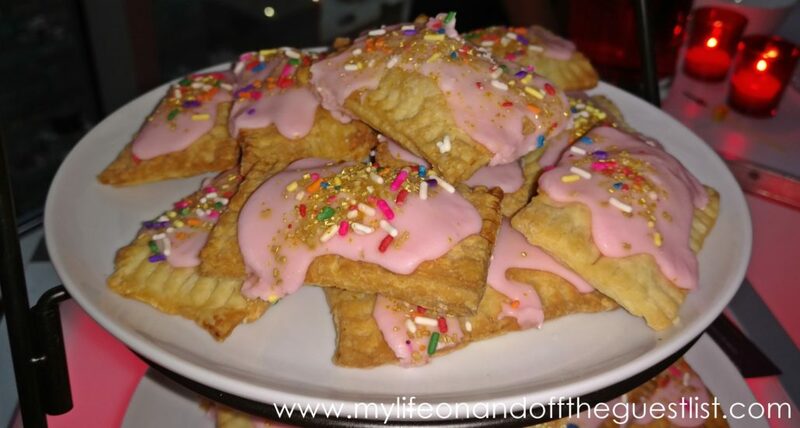 Negroni Pop Tarts ($6.00 each), classic treats filled with a Negroni custard and topped with an orange and Campari icing, and sprinkles, from Butter & Scotch; Negroni Nuggets; and Negronuts, Negroni donuts filled with Carpano Antica Whipped Cream, topped with Campari Glaze and drizzled with Orange Compote, from The Doughnut Project. 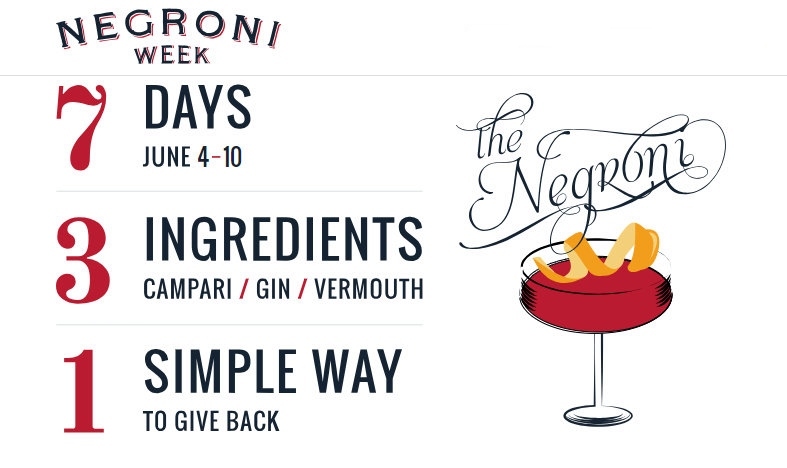 A portion of proceeds from Negroni Week goes to the charity of the vendors choice, such as City Harvest, Mercy Corps, and the WILD Foundation. Will you be partaking in the week-long international celebration? 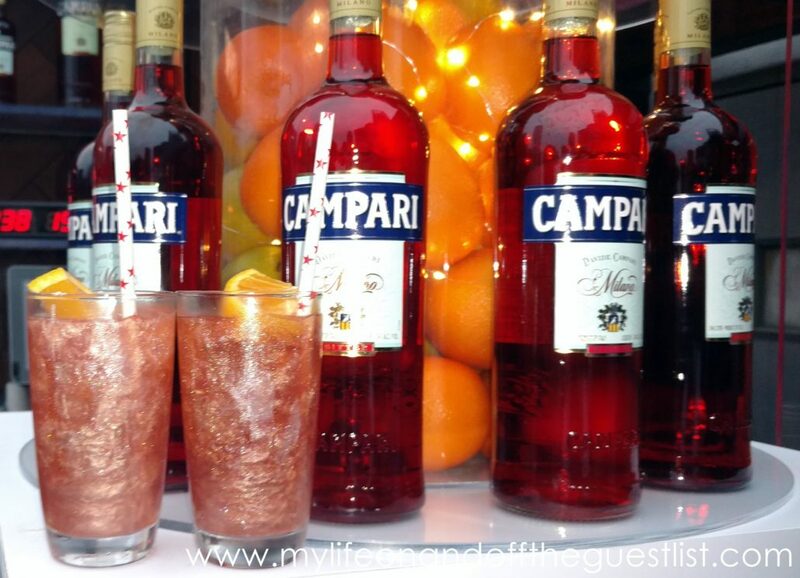 How will you be celebrating Campari’s fifth annual Negroni Week?